...this battle...was a mass of mixed up confusion from beginning to end...Would to God it was night or reinforcements would come. Four regiments of volunteers from Arkansas and Louisiana, moving "with all the vim and vigor [of] regulars," ran headlong and unawares into two Illinois regiments near here. The close-range fighting was so intense that men from both armies threw themselves flat on the ground to survive the hurricane of flying lead. Military order dissolved. Squads of soldiers rushed from stump to log to tree in the thick, tangled undergrowth, kneeling to fire. An Illinois soldier later said he could not see even 20 feet ahead. Chaos and combat raged through Morgan's Woods all afternoon, as dense smoke from thousands of muskets obscured the darkening forest. Colonel Louis Hebert led the Confederate attack here. When Hebert became disoriented in the smoke-filled woods, Union soldiers took the Louisianan and two other colonels prisoner. Without leaders the Confederate regiments here lost momentum and focus. Location. 36° 26.657′ N, 94° 3.096′ W. Marker is near Garfield, Arkansas, in Benton County. Marker is on Military Park Road (County Road 65), on the right when traveling north. Touch for map. 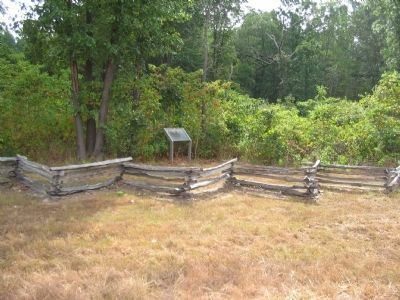 Located at stop four, the Leetown Battlefield, on the driving tour of Pea Ridge National Military Park. Marker is in this post office area: Garfield AR 72732, United States of America. Touch for directions. Other nearby markers. At least 8 other markers are within 2 miles of this marker, measured as the crow flies. Stand to Your Posts! (within shouting distance of this marker); Save the Cannon! (about 300 feet away, measured in a direct line); A Crisis in Command (about 300 feet away); A Village Full of Wounded Men (approx. ¼ mile away); Leetown (approx. ¼ mile away); Two Armies Collide (approx. 0.7 miles away); Getting Ready To Fight (approx. 1.1 miles away); City of Soldiers (approx. 1.1 miles away). Touch for a list and map of all markers in Garfield. 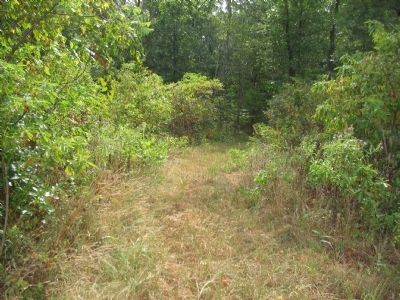 The Park Service has taken on the challenge of restoring the woods and fields within the park to wartime appearances. 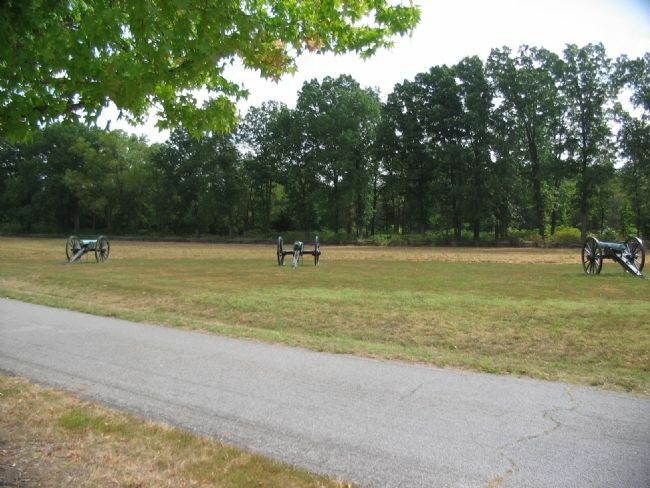 Artillery pieces on display point into Morgan's Woods to depict Battery A, 2nd Illinois Artillery firing upon the Confederate advance. More. 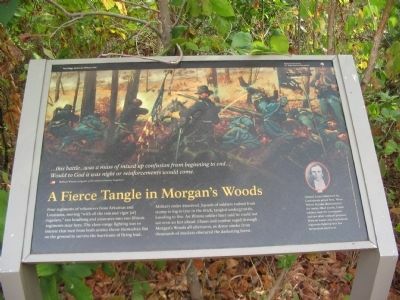 Search the internet for A Fierce Tangle in Morgan's Woods. Credits. This page was last revised on June 16, 2016. This page originally submitted on September 10, 2010, by Craig Swain of Leesburg, Virginia. This page has been viewed 1,069 times since then and 10 times this year. Photos: 1, 2, 3. submitted on September 10, 2010, by Craig Swain of Leesburg, Virginia. 4. submitted on September 11, 2010, by Craig Swain of Leesburg, Virginia.